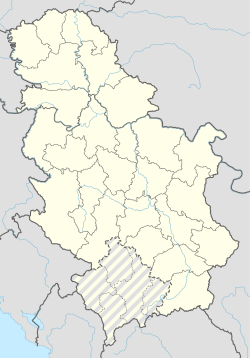 Pančevo (Serbian Cyrillic: Панчево, pronounced [pâːnt͡ʃe̞v̞ɔ̝]) is a ceety locatit in the soothren pairt o Autonomous Province o Vojvodina, in Republic o Serbie. Pančevo is locatit on the banks o the Danube an Tamiš, in the soothern pairt o Banat, an it's the admeenistrative heidquarters o the ceety o Pančevo an the Sooth Banat Destrict. Pančevo is the fowert lairgest ceety in Vojvodina bi population. Accordin tae preliminary results o the census o 2011, in Pančevo live 76,203 fowk. Accordin tae the offeecial results o the year 2011, in the ceety o Pančevo live 123,414 indwallers.